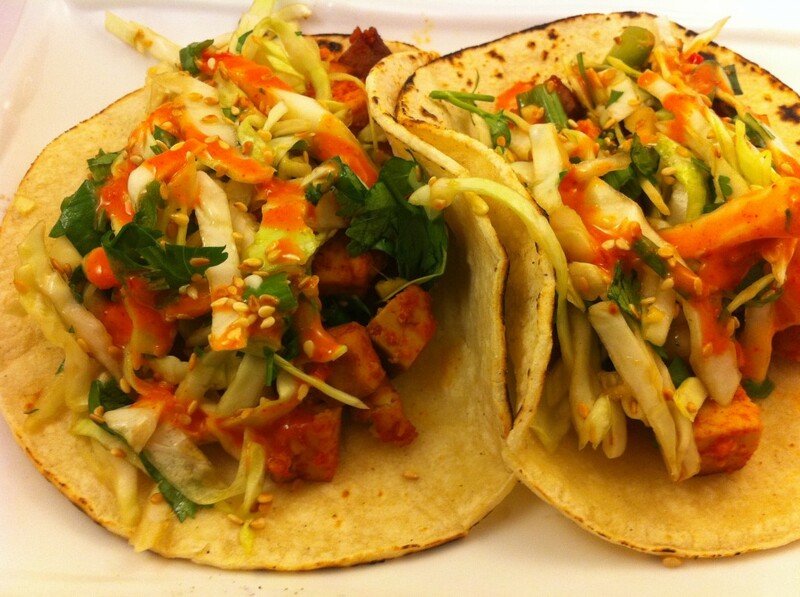 Korean tacos became popular a few years ago due to Kogi taco trucks and oh my are they good! They also make these amazing kimchi quesadillas (here is my version) that are to die for. For a while now, I’ve been wanting to try making some Korean style tacos and finally got around to it. I was super inspired by the Korean taco recipes on Asian Enticement especially the sweet and spicy mayo and the Korean sangchu lettuce salad. I was originally going to marinate tofu in a Korean bbq sauce, but then thought about the gochujang in fridge. Gochujang is this amazing pungent Korean chili paste. You can read more about it here. So I decided to marinate the tofu for the tacos similar to this recipe. Next time I might try Korean bbq sauce. I bet it would be good too! For the sweet and spicy mayo, if you have Japanese mayo I bet it would be even more fantastic (smoother and sweeter) but Best Foods (full fat!) is good too and what I used. I liked the idea of adding sweet chili sauce that I found in this recipe. Then I thought I should throw some of the gochujang into the sweet and spicy mayo too! For the mayo, really just make sure to use mayo, something spicy (preferably sriracha sauce , sometimes called rooster sauce because of the rooster that is usually on the label) and something sweet. I loved the combination of what I used, but I’m sure other ways would work well. This recipe for Korean tofu tacos looks a little complicated because of all the ingredients, but they don’t take very long to make. There isn’t much chopping so the ingredients are more just a bunch of sauces mixed up. Mix the gochujang, sesame oil, vinegar, and soy sauce. Toss the tofu in the marinade, sprinkle with a little salt, and let sit while prepping other ingredients. Broil or saute in a skillet the marinated tofu until lightly browned. Toss the cabbage, green onions, cilantro, green chili, and ginger with the dressing. Lightly spray corn tortilla with olive oil spray and cook over the open gas flame until soft and a little browned on the edges (it gets soft fast, but then you need to cook it more so it firms up a little again). Make up your tacos: tortilla, marinated tofu, salad, a drizzle of spicy & sweet gochujang mayo, and toasted sesame seeds!